21° 30.25' N., 50° 28.30' E.
A massive meteoric aerial burst equal to ~12 kilotons lit up the sky over desert sands in the Empty Quarter of the Rub' al Khali, Saudi Arabia, at a site known as Wabar or "Al Hadidah" (= the iron) in Arabic. The name Wabar is a transliteration of Ubar, but is not the actual site of the legendary lost city that was rediscovered in 1992 at a site 400 km south of the Wabar site. 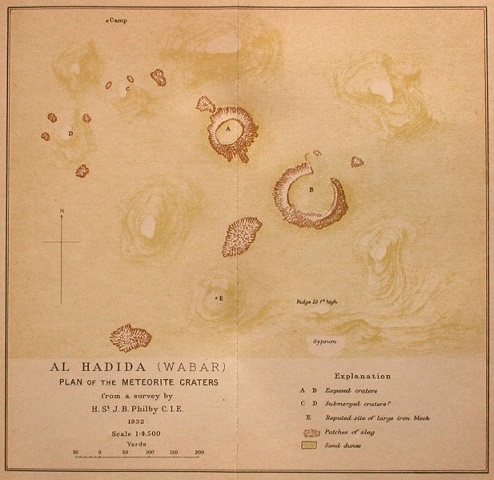 The Wabar site was known to the local Bedouins for generations, but remained undescribed until visited by the British explorer H. Philby in 1932, and later surveyed by E. Shoemaker and J. Wynn in 199495. The impact site consists of three craters named Philby-A (64 m diameter), Philby-B (116 m diamter), and "11 m crater", all of which since their discovery have experienced repeated infilling and excavation by aeolian sands (Gnos et al., 2013). The three impact craters are situated on 125 acres of a constantly shifting dune field. Found dispersed in and around the craters was shock-bleached/-lithified sand, both black and white-greenish, aerodynamically-shaped, vesicular glass bombs (some containing highly shocked silicate phases such as lechatelierite, coesite, and stishovite), black melt droplets referred to as "pearls", and remnants of FeNi-metal spalled from the impacting body (Gnos et al., 2013). Results of petrography and microchemistry conducted by Hamann et al. (2013) reveal that the black impactite is composed of a quenched, vesicular, glassy mixture of two immiscible liquids; i.e., an emulsion of one phase enriched in Fe+2 and Ca+2 (derived from the FeNi-metal of the projectile) appearing as nmµm-scale spherules, within a dominant phase enriched in silica (derived from the 2030-m-deep target sands). A third immiscible component consists of µm-scale metallic FeNi-spherules (up to sub-mm scale) representing projectile remnants. The largest known mass, which was finally collected in 1965 400 m south-southwest of the largest crater, is a shield-shaped, aerodynamically-oriented, 2,040 kg mass known as the "Camel's Hump". Other surface recoveries include a 210 kg mass and several other multi-kg masses, as well as numerous small, twisted fragments like the 14.1 g specimen pictured above. Additional meteorite remnants uncovered below the sand have been completely weathered to shale. Examination of the distribution of the craters and the individual regmaglypted fragments led Gnos et al. (2013) to conclude that the meteoroid arrived from the south. Wabar is a member of the IIIAB group of irons, a group considered to be closely related to group IIIE (Bishop et al., 2012), and exhibits a medium Thomson (Widmanstätten) structure (Buchwald, 1975). Black glass pearls like the one pictured below were found about a half-mile northwest of the crater, indicating that a wind was blowing from the southeast at the time of the fall. This is consistent with the prevailing wind conditions during the early evening hours in early Spring. These pearls are composed of 90% local quartz sand and 10% microscopic particles of meteoritic FeNi-metal. Gnos et al. (2013) ascertained that the pearls contain the largest component of projectile material, which lowered the melting point and the viscosity of the melt, allowing for complete degassing as attested by their lack of vesicles. It is estimated that the original mass weighed at least 3,500 tons and that the largest impacting fragment was ~9 m in diameter. The impactite distribution pattern indicated to the early investigators that the object arrived from the northwest at a shallow angle. From measurements of the rate of infilling of the craters by sand, as well as through TL studies, it is estimated that the fall occurred between 235 and 416 years ago, or an average of 289 (±46) years ago. While there is some testimony that the fall could be associated with a witnessed event that occurred in 1863, current evidence suggests an earlier fall. Notably, two historical poems written by separate authors have been found that describe the fall of a fireball over Tarim, Yemen, a town located 620 km south-southwest of the Wabar site (H. Basurah, 2003). In these poems, the authors specify that the fall occurred during the night of Saturday, September 1, 1704 (~300 years ago), a date in excellent accord with the TL data. The trajectory of this fireball over Tarim, traveling approximately south to north, is also consistent with the conclusion of Gnos et al. (2013) based on the location of impact craters, ejecta blankets, and later-arriving individual meteorite fragments. Of the nearly two hundred craters discovered on Earth, the Wabar Crater is one of only seventeen to contain remnants of the original impacting object. 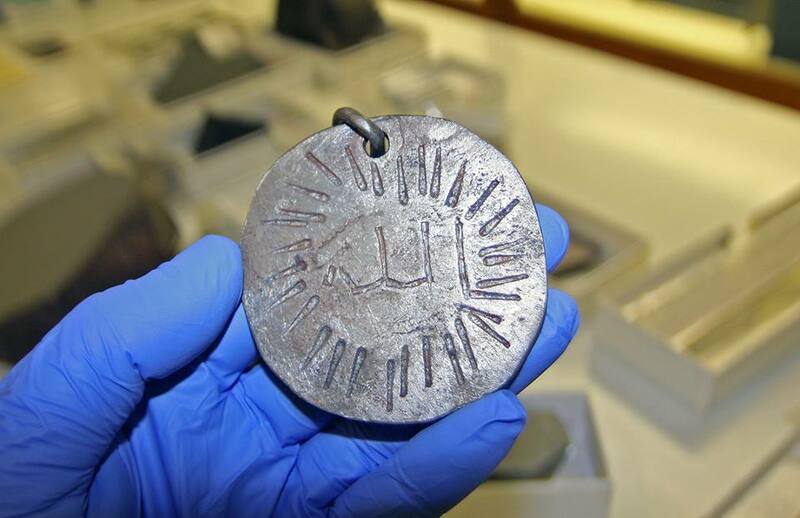 An iron pendant known as 'Qarabawi's Charm' (see photo courtesy of Mike Hankey), which had previously been hung around a camel's neck by a member of the Egyptian Ababda nomadic tribe to ward off evil, was sent by the Egyptian Geological Museum in Cairo to the Smithsonian Institution in 1974 (Mayne et al., 2010). Careful studies verified its meteoritic origin through its Ni content of 6.8% and the presence of taenite lamellae. 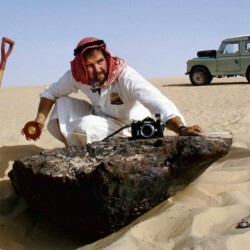 An extensive comparitive search of all Middle-East irons revealed that the Ni content of the Wabar iron meteorite is identical to that of the Camel Charm. Advanced laboratory analyses of the two materials were conducted, and it was determined that the most likely source material for the Camel Charm is the Wabar iron (Mayne et al., 2019).